The games will release in reverse order, starting March 29. The Resident Evil franchise will be celebrating its 20th anniversary in March, and in celebration of that Resident Evil 4, 5, and 6 will be playable on PlayStation 4 and Xbox One, with releases coming throughout the year. "In March 1996, the world was introduced to the first Resident Evil game, which helped shape survival horror as we know it and has since brought you some of the most loved games of all time," reads the description on the announcement trailer. "You've been able to play through the origins stories that started everything with the recent releases of Resident Evil and Resident Evil 0, and we've confirmed that a remake of Resident Evil 2 is on the way. Since then, the series and story have evolved to amp up the action and introduce new epic gaming moments with Resident Evil 4, 5 and 6." All three games will be playable on PS4 and Xbox One, for $19.99 each. 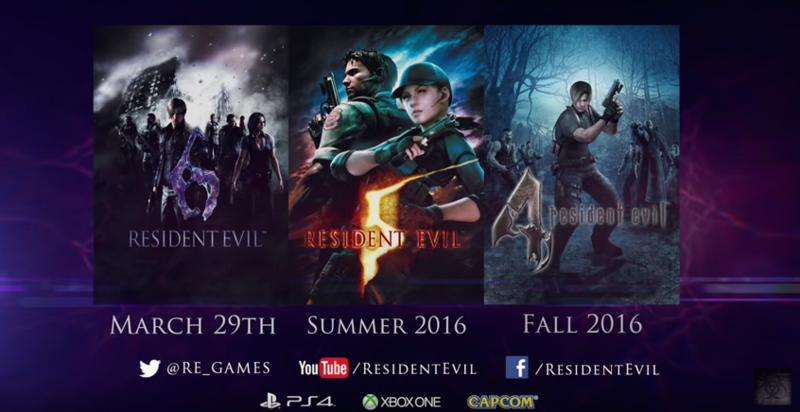 Weirdly, the release schedule starts with 6 and works its way backwards, with Resident Evil 6 available March 29, Resident Evil 5 coming this Summer, and Resident Evil 4 releasing some time in the Fall. Is this a countdown to something? Did someone mess up the scheduling? Discuss.